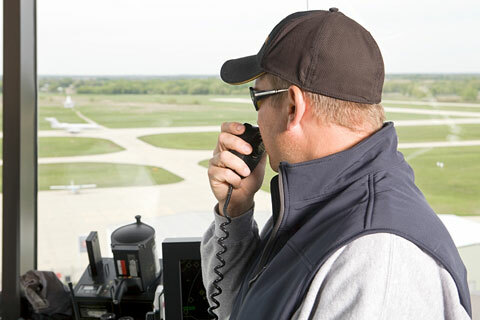 Air traffic controllers ensure that both commercial and private aircraft travel safely. They are responsible for making sure airplanes maintain a safe distance from one another, organize the flow of airplanes in and out of airports, and keep pilots abreast of weather developments. Some air traffic controllers work specifically on arrivals and departures, while others work with all airspace at the airport. Air traffic controllers rely on both radar and their own observations to guide aircraft, and work as a team, with several controllers directing one aircraft along its route. Those who want to become air traffic controllers must enroll in an FAA education program, and must pass a pre-test that indicates whether the applicant has the aptitude to learn the duties of an air traffic controller. In order to be eligible, the applicant must have completed either four years of college, or must have three years of work experience. In addition to completing the FAA program and passing the pre-test, applicants must meet eligibility requirements and must receive recommendations in order to be eligible to work as an air traffic controller. Those who meet all of these qualifications then attend the FAA Training Academy in Oklahoma City for 12 weeks of training. The work environment for air traffic controllers is highly stressful, due to having the responsibility for airplanes and their passengers. Some air traffic controllers must work in near-darkness to best view the radar. Most controllers work a 40-hour workweek, and because airports are open 24 hours a day, 7 days a week, frequently have to work night and weekend shifts. Air traffic controllers must be able to multitask effectively. In addition, they must possess excellent concentration skills, exemplary communication skills, and the ability to work well under pressure. While securing a spot in an FAA training program is highly competitive, those who do secure spots and meet all qualifications have excellent job prospects. For information about qualifying and applying for air traffic controller jobs, visit the FAA website. For information about air traffic controller careers, visit the National Air Traffic Controllers Association website.